The phone numbers page allows you to view and manage all of the phone numbers you hold on your account. At the very top of this page there is a handy search box where you can search for an individual number on your account. This is very useful for customers with a large quantity of numbers on their account to allow them to identify and update individual numbers when required. Besides the search box there is a handy button to purchase new numbers, his will direct you to a new page. 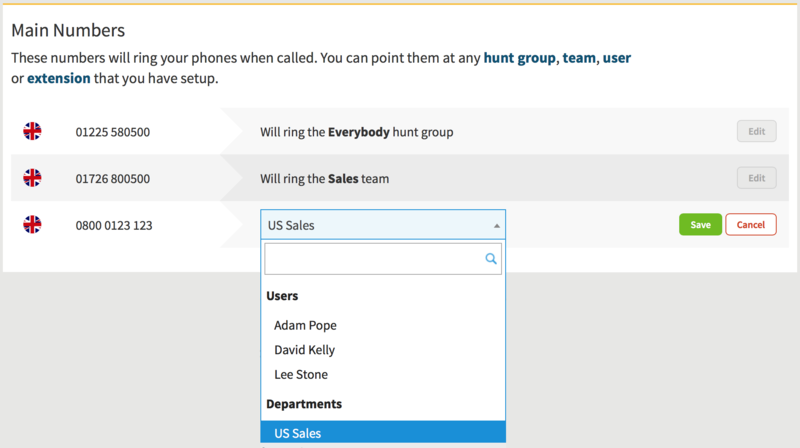 This menu shows you your main telephone numbers and where they are being directed to, for example at a Hunt Group, User or individual Extension. You can then edit the destination of the number by clicking the 'Edit' button to the right of the number. When you click 'Edit' you will be presented with a drop down menu with the available destinations presented in a drop down menu and again with a handy search box for users with a lot of destinations. Once you have selected the destination you wish to point the number to, click the 'Save' button. The Forwarding Numbers section allows you to view and change the destination of any of your forwarding numbers (Gradwell Additional Numbers). To edit or assign a destination to any of your forwarding numbers, simply select the 'Edit/Assign' button next to the number in question. Once done you will be presented with a drop down menu where by you can select one of your Gradwell main numbers to direct the number to, or unassign the number if you wish to disable it. Once you have selected the destination you wish to point the number to, click 'Save' to finish. Under the Fax Numbers heading you can view and edit the destination email/s which your faxes are emailed to. To edit the destination email/s the faxes are sent to, click 'Edit' next to the number in question and then enter the destination email in the box. If you are entering multiple email addresses please separate them by a comma ',' and space. For example 'support@gradwell.com, tech@gradwell.com'. The SIP and IAX section shows you the current URI the number is pointing too. This section works exactly the same in that you simply click 'Edit' next to the number in question and enter the required URI. This section lists any numbers you have on your account that can not currently be used. Some examples may include numbers that you have reserved as well as numbers they may have since ported away from us. If you have a number here you wish to use, please contact our Support team on 01225 800888 and they should be able to assist you with this.